Four hundred years is a very long time. For that entire period, Virginia has been governed by a representative legislative body. From the Jamestown settlement in 1619 to Williamsburg to Richmond, the House of Delegates (formerly House of Burgesses) has met each year to pass laws – some good and some bad – reflecting the preferences of those who elected us to serve. We convened on Wednesday, January 9, 2019, for this 400th anniversary session, and, as with all 399 sessions before, the issues we will discuss are important to the people of Virginia. 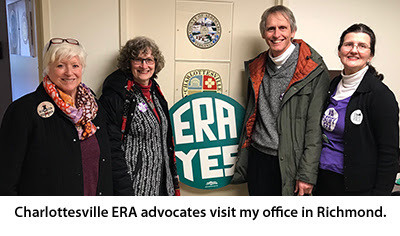 • Will Virginia become the 38th state to ratify the Equal Rights Amendment, so it will be placed into the U.S. Constitution? This is one of my priorities, but past efforts to get an ERA resolution onto the floor of the House of Delegates have been stymied by committees controlled by conservative lawmakers. Expect some close votes. A Senate committee passed the resolution Wednesday on an 8-6 vote, and so the Senate will be voting on that resolution during the coming week. The House version has not yet been heard. • Will Virginia join the Regional Greenhouse Gas Initiative (RGGI), a major effort by a consortium of states to reduce greenhouse gases, which addresses a major cause of climate change while bringing additional revenue to the Commonwealth? I will be carrying this very significant measure, and I hope it does not fall prey to partisan bickering. • Will the General Assembly act to limit the Trump Tax Plan’s impact on Virginia taxpayers? The Governor has a plan to combine targeted tax relief with strategic investments in education, environmental protection, and broadband—critical to a successful future for our children and our state. I support it! • Will Virginia allow casinos? I do not yet have a definite position and am continuing to learn more from both advocates and opponents; I would love to hear my constituents’ thoughts on the issue. • Can we (finally) pass a Virginia constitutional amendment to create an independent non-partisan redistricting commission and end gerrymandering? If we can pass a bill this year, that would be the first step; and if we hope to have non-partisan redistricting happen in 2021, we must get that first step accomplished this session. I support it, as I have for years. • Can we limit the role of ‘big money’ in politics? I am supporting two bills to do this – one to restrict the amount individuals can contribute to a candidate’s campaign, and another to prohibit publicly-regulated utilities from giving to campaigns at all. • Will we provide more tools for consumers seeking relief from rising health care costs? I have three bills to do this: one will clarify the Bureau of Insurance’s ability to provide rebates when consumers are overcharged, the second will require health insurance providers to provide more information to the Bureau about the basis of any rate increases so they may be better scrutinized, and the third will inject more pricing transparency about the costs of various medical procedures so that customers can shop for the best price and obtain a financial benefit if they save money. • Will we enact any gun safety measures this year? Only one gun safety measure passed in 2018. In this session, I am supporting measures that create universal background checks and restrict the purchase of automatic weapons, and am sponsoring a bill that will allow courts to intervene to prevent youngsters from getting access to guns if they are having mental health challenges. The 2019 session is a “short” 46 days, and we will adjourn on February 23. Although there are not as many bills to consider this year since delegates are limited to filing 15 (and Senators may file not more than 25 each), I will still look to my constituents to let me know which bills, and which issues, matter the most to them. If there is an issue upon which you have a position, please do not hesitate to email me at DelDToscano@house.virginia.gov, so that my staff and I can have the benefit of your thoughts. Another important way to help me know what is important to the people of the 57th District is my annual survey, which should arrive in your mailboxes soon. Please take a few moments to complete and return yours; if you do not receive one, please call my Richmond office at 804-698-1057 so we can arrange to get one to you. And please come see us if you are in Richmond during the session. We are in Room E210 of the Pocahontas Building, 900 East Main Street.